A speaker from New York's W.A.G.E. campaign joined Glasgow-based artists this week to talk about the 'non' payment of artists' fees. a-n reports from Glasgow. It was while listening to the speeches at the launch of a major art festival that Corin Sworn realised something had to be done about the issue of artists’ fees. A city councillor was talking about the huge economic impact that all this fabulous contemporary art would have – the benefits to the tourist trade, the money that would be spent in the city, the jobs and regeneration it contributed to. Glasgow-based Canadian Sworn was one of the many artists exhibiting during the three-week festival. But, unlike the hoteliers, restaurateurs, taxi drivers and countless others, getting paid for her work involved a process of negotiation. Sworn was speaking at a packed event in Glasgow on Tuesday night organised by the Scottish Artists Union (SAU) and Transmission Gallery (previewed here). Fellow artist Charlotte Prodger introduced the evening, explaining that it was prompted by a spate of institutions asking her to show work, but with no mention of a fee: “Silence on this issue just perpetuates the idea that artists are willing to work for free,” she said. Formed in 2008, W.A.G.E. is not a union. It campaigns specifically around the issue of artists’ fees, focusing on not-for-profit galleries and museums. Soskolne showed a W.A.G.E. campaign video that distilled its objectives into succinct slogans, such as ‘Renumeration of cultural value in capital value’; ‘Mutual respect between artist and institution’; and – one for every artist, surely – ‘We demand payment for making the world more interesting’. Soskolne made reference to filmmaker Hollis Frampton’s famous 1973 letter to the Museum of Modern Art (MOMA) regarding a retrospective of his work to be shown, in the words of the MOMA curator who contacted him, ‘all for love and honor and no money is included at all…’. Suffice to say, Frampton wanted to be paid. It was, though, rather more recent information regarding New York’s art scene that proved most shocking. Soskolne talked about the results of a recent survey into artists’ fees, based on the responses of artists. By far the worst offender was Performa, ‘the internationally acclaimed biennial of new visual art performance’. “Performa were upset by this, which is good – I think you call it naming and shaming in the UK,” said Soskolne. “They got in touch and said they wanted to make a statement. W.A.G.E. responded with, ‘Yeah, let’s meet, we’d like to see your budget.’” They’re still waiting for a reply. An audience discussion followed the talks. Unfortunately, a-n was unable to stay for this. 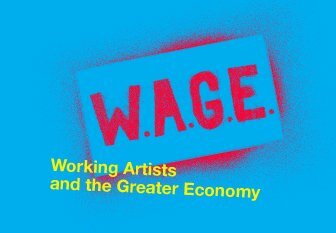 Wage rage – Emily Speed gives an overview of W.A.G.E. activity. Fees & payments – advocacy, advisory and practical resources including The artist’s fees toolkit. Code of Practice – draws from the experiences of practising artists and their collaborators to set out the principles that underpin good practice. Now in new flip-page format. Getting Organised – Artists’ talking blog by Emily Speed advocating better working conditions for artists.